Everyone needs a good bag for carrying books and school supplies, whether you’re sending a tot off to preschool or if you are starting night classes. Here are a few of my favorite free bag project tutorials gathered from the web to give you some ideas for stithcing up a back-to-school bag. 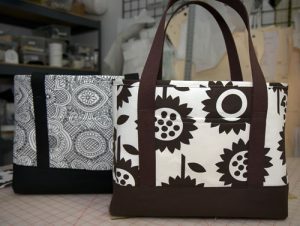 This sturdy tote with outside pockets is perfect for books and school supplies! Download a printable version of the tutorial or scroll down the page to read the online version right here from jcaroline creative!.com. 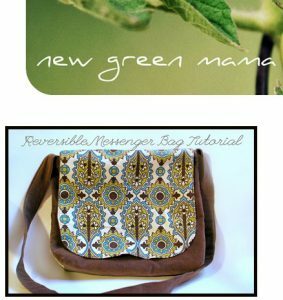 Get two book bags in one with this clever reversible messenger bag project from Jen over at New Green Mama. Visit Jen’s blog for the tutorial right here at New Green Mama. I think this backpack made from oilcloth is sjust the cutest! 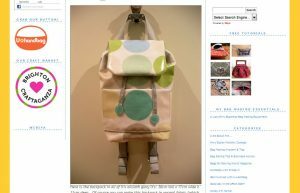 Check out Lisa Lam’s blog, U-handbag and get her backpack tutorial right here. Hi. The word “weather” in your description refers to rain, snow, sleet, sun….maybe you meant “whether,” which refers to introducing the first of two or more alternatives. No offense intended. I would certainly like to know if I had made such an error in one of my posts.